Musumé. Photo by Ben Gibson. The Arts District's newest addition needs work. People who complain about going for sushi because they’ll be hungry again in an hour are the worst. Sushi is made from fish. Fish is high in protein. Protein makes you stay full. So, surrender that excuse and be honest with yourself: you just don’t like sushi. If you gorge on enough hunks of buttery yellowtail and fatty slabs of marbled salmon, you will feel full. It’s science. That said, I met some sushi-loving friends, who also happen to be food writers, at Musumé for dinner earlier this week. The Asian fusion concept opened in Hall Arts, next to Flora Street Cafe, in late January, and none of us had been yet. We were seated at a four-top in the middle of the concrete-floored dining room. The restaurant wasn’t packed, but several diners were settled around us in plush gray booths and at dark wood tables. We clutched the oversized menus, placed them in our laps, and got down to business. The first thing that grabbed my attention was the Forbidden Halibut. Why was this fish banned? Rimshot. I cracked a joke that fell as flat as this one, and continued reading: pan-seared halibut, forbidden rice, steamed Asian greens, turmeric guerre blanc, and nori salt. One of my friends ended up ordering this dish. The tender white flesh fell apart with the gentle prod of her fork. I watched as she scooped the fish and black rice into her mouth and shrugged. “It’s fine,” she declared. We ordered the ton gyoza for the table. The wild boar dumplings, glistening in dried cherry nimono sauce, came out on a white ceramic plate. The meat, if lukewarm at best, was subtly gamey and tender. Dried cherries toppled as we clenched the dumplings with our chopsticks. We all shrugged. It was fine. The sushi was pricy. Rolls range from $16 for vegetables stuffed in rice paper to $22 for the Texas Blossom: tempura shrimp, jalapeño, cucumber, wagyu beef, crispy onions, and spicy aioli. 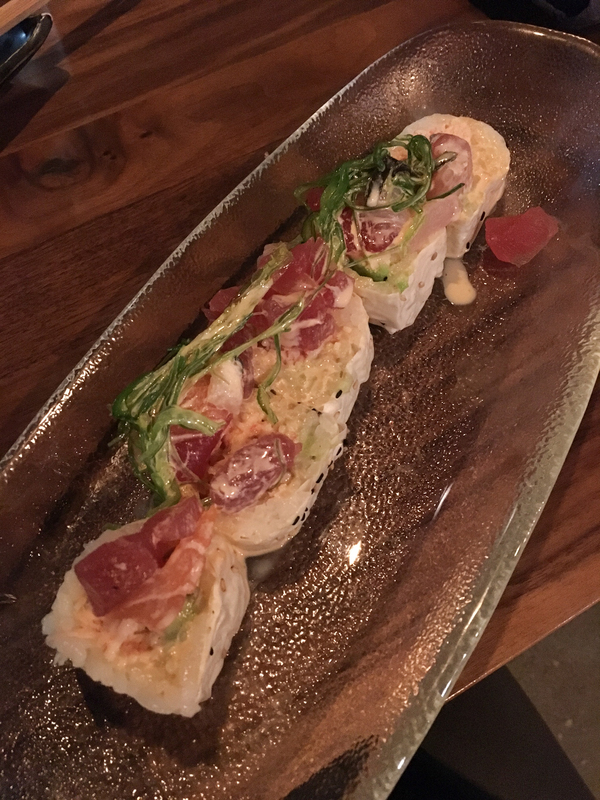 I ordered the Hot Mess: snow crab and avocado wrapped in soy paper, topped with yellowtail, tuna, salmon, spicy aioli, and seaweed. The dish cost $20, so I was going to start there and then see how I was feeling after. My favorite thing about ordering sushi is to keep the rounds of fish coming. But at these prices, one needs to make sure it’s worth it. What came out next was baffling: five pieces of sushi that looked like they had been hand-rolled during some new age home economics class. Inconsistent lumps of salmon and tuna melded with creamy aioli over rice. Seaweed was haphazardly flung on top. And then, the saddest part, a melancholy hunk of tuna lobbed to the side of the roll. Was it intentionally placed there? Did it tumble from the mound as the dish was being delivered to the table? I stared at the plate for a minute trying to decipher whether I was being trolled. On the one hand, it was hideous. But on the other, the dish was called Hot Mess. Could this be an imaginative attempt at manifesting a true mess? Was it possible I just didn’t get it? My concentration was shattered when my friend, sitting to my right, blurted out an obscenity that I’m not going to write here. She was as appalled as I.
I shoveled the pieces into my mouth and shrugged. It was fine. When it came time to order more food we respectfully declined. For the first time in my adult life, I was one of those people who I despised so much. I was the person who went for sushi and was still hungry not even an hour later. We walked into the damp night, appetites swirling, and into the warmth of Shoals Sound & Services. There, under the amber glow of the bar lights, we ordered a bologna sandwich and empanadas. If you gorge on enough fried dough and greasy meat, you will feel full. That’s also science.